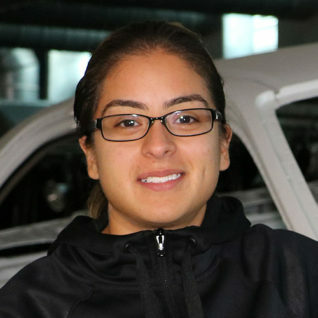 Laura Salas grew up around body shops. Her father has been a collision service tech for over forty years. Laura knew exactly what she wanted to do with her life. She looked at private schools with automotive service programs, but they seemed to cost more and offer less than community colleges. There were community colleges closer to her home in Pittsburg, but none of them had an option to focus on collision. A teacher in her high school Regional Occupation Program recommended Laura check out the Automotive Services program at Contra Costa College. When she asked around, she found out it had a great reputation. Laura discovered why soon after she enrolled. She loved the program, instructors and other staff. She especially loved how hands-on the experience was. Laura graduated with an Associate in Science Degree in Auto Collision Repair Technology. She worked for other shops for two years, then opened one with her father. She also joined the automotive services advisory committee as its alumni representative, where she served alongside shop owners, dealers and the President of the California Auto Body Association. The committee’s job is keeping the department up to speed on the demands of the industry. While serving on that, she heard about an opening for an instructor to teach in the collision program. Now she leads the program that started her career.